The mobile app industry is growing rapidly, and today’s consumers are increasingly adopting mobile as their medium of choice for browsing, researching, and purchasing things. The mobile app development industry has attained the focal point these days due to enthusiastic & innovative ideas propelled in app development. However, taking an appropriate decision at incite of the moment is not that simple. Development of Robust mobile app, Getting a hit of million downloads on their developed app, and keep following the continuity of making the cutting-edge mobile apps in a dedicated manner. Most of the heads must be nodding towards reveling YES. With the trend of getting your business listed into the reach of consumers, it is necessary to adopt the Mobile App Development. This industry is really growing at an unbelievable pace. Despite the leaps and bounds of this industry, it has mistaken to be blocked with some misleading blog myths. Although, it will be correct to state that the path of mobile app development is confusing & tricky as well. There is a myth about mobile app development that it is a long, tricky process because everyone is aware from of the fact that techniques & traditional methods of mobile app development are generally time-consuming as well as tricky also. Hence, it becomes obvious that it approximately consumes six months to launch a new app. To avoid this myth from mobile app development, now the developers choose Hybrid app development. Hybrid app development approach helps decreases the development time due to its code-reusability feature. With the help of Hybrid app development, developers are allowed to use the single code with few alterations in many applications and can reduce the development time as well as complexities measures under the mobile app development process. Cross-platform app development has eliminated this by allowing developers to develop mobile apps that can be used on multiple mobile platforms. Many of the people believe that developing a productive and feature-rich mobile application is only depends on coding or can say that mobile app is just about coding. This statement is partially correct that coding is the heart of the mobile app development but this is completely a myth that coding is all required in Mobile app development process. It is a primary requirement to have knowledge about Android app development and iOS app development, but fully designing an app starting with the initial idea, covering functionality design; graphics & user-experience with higher quality are also requiring part in the process of mobile app development. On the other hand, an average development of any project comprises average stakeholders like project managers, developers, management team, IT Team, In-house development & designing team. To bring stakeholders on the same page and to ensure that the whole development process takes flawlessly, a high level of collaboration is required. Mobility is not only about developing apps, but it is like a treasure that requires a wider mobility strategy, to find out. One of the common myths about mobile app development is considering it as a small version of an enterprise’s website. One ends up stuffing more & more features into it when the very concept about every mobile app is to deliver specific & focused features & functionalities to targeted set users. The concept behind the mobile app is like “Killing two birds with one stone”, means achieving multiple targets with a single source. Another related myth is that business apps shall be data-heavy, placing high loads on the devices and backend system. Truth is- it is expected that an average 4G Smartphone will use 5114 MB per month in cellular data. Most of the people think that a huge amount is needed to develop an app, and most of the people wind up their thoughts of developing mobile app due to the myth that mobile app development needs a huge amount. The total amount to be spent on mobile app development is truly relies on the usefulness, features, functionalities, developing multisided quality, and the variety of mobile app you may need for your business or brand. At the end of the statement, it can be stated that the overall cost of developing an app completely depends on the idea and the thought of app. It is partially true that high-quality graphics are so important for the success of mobile apps. However, it cannot be a full truth, it is partially a myth that everyone thinks. It is important but does not guarantee an app will be successful & millions of users will download it. Besides graphics, there are lots of other things that contribute to an app’s success & bring highest users rating, including User Experience, simplicity, and clear-cut functionalities. One should also make sure that their app defines its purpose visibly. Therefore, along with the graphics of the app, UI & UX designs also holds a vital part in making an app successful. Well, it cannot be a lie to say that paying for marketing is the simple and easy way to take; however, it is not necessary that it is an effective one. Only spending on marketing cannot get the success for an app but it requires high-end, technically strong & feature-rich qualities in the app. People are looking for the app, which caters them what they crave for, and if they find the same, they will surely hit the store. Well, with paid marketing you only can get the number of downloads but unable to get the popularity among users. Most of the people think that the small or one-screen app requires less development time as well as less development cost & relates the size of the app with the development time & cost. It is completely a myth. The application that appears in the portfolios of the brands consumes months to developing but the third-party plugin or support integration might be enough to consume days and weeks of development. With the detailed blueprints, the whole development process is time taking; however, technology experts can help in saving time & efforts. This statistic holds data on the number of apps available for download in foremost app stores as of the third quarter of 2018. As of that period, Android users were able to choose between 2.1 million apps. Apple’s App Store remained the second-largest app store with almost 2 million available apps. However, do you know that many of these apps have never even downloaded? People are not aware from almost half of the apps that had uploaded on App Store & Play Store. Once the app development process has completed and apps lay down in a ready-to-launch statement, releasing is not only the last task, although it requires a perfect marketing of the application so that most of the eyes can have the glance at the app. 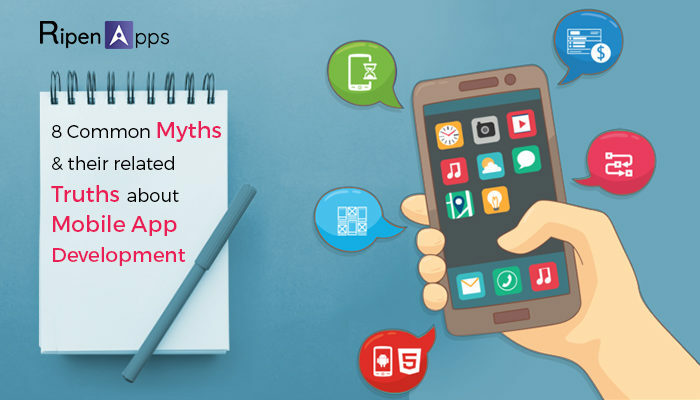 Well, these are the main mobile app development myths that many people have in their mind. If you are a business owner or a startup and looking forward to having your own application, you can get in touch with a leading mobile app development company that has vast experience in the mobile app domain. Is there any other query pointing on your head, feel free to contact us at info@ripenapps.com.